County of Norfolk: Ashwicken, Babingley, Bawsey, West Bilney, Castle Acre (2), Castle Rising, Congham, Flitcham with Appleton, Gayton, Gayton Thorpe, Gaywood (2), Grimston (2), Harpley, Hillington, Leziate, Great Massingham (2), Little Massingham, Middleton, Mintlyn, West Newton, Pentney, Roydon, North Runcton, Sandringham, Setchey, East Walton, West Acre [Westacre] with Custhorpe, East Winch, West Winch, Wolverton [Wolferton], North Wootton, South Wootton. Later Additions (all from 1902): North Lynn (from 1896). The population falling within the Union at the 1831 census had been 11,489 with parishes ranging in size from Mintlyn (population 31) to Castle Acre (1,333). The average annual poor-rate expenditure for the period 1833-35 had been £8,952 or 15s.7d. per head of the population. 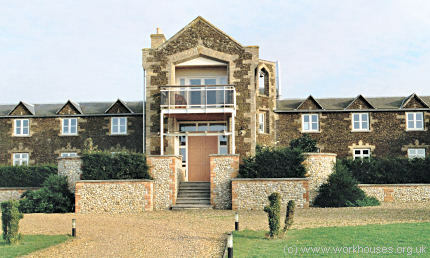 A new union workhouse was erected in 1836 at a site near Gayton. The Poor Law Commissioners authorised an expenditure of £5,146 on construction of the building which was intended to accommodate up to 150 inmates. It was designed by William J Donthorn who was also the architect of workhouses for the Aylsham, Downham, Erpingham, and Swaffham Unions. His design for Freebridge Lynne resembled that of Aylsham, being an elongated cruciform plan with cross-wings placed almost to give a double-cruciform appearance. The workhouse location and layout are shown on the 1884 OS map. Freebridge Lynn from the north-west, 2000. The entrance block at the centre separate the male and female accommodation to each side. Freebridge Lynn entrance from the west, 2000. 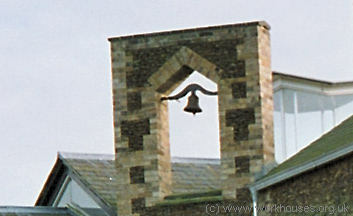 The workhouse bell, by which the inmates' day was governed, hung high above the entrance block. Freebridge Lynn workhouse bell, 2000. Freebridge Lynn from the north-east, 2000. 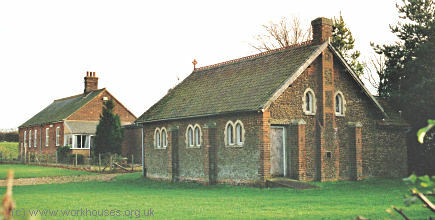 Freebridge Lynn chapel from the west, 2000. From 1904, to protect them from disadvantage in later life, the birth certificates for those born in the workhouse gave its address just as 1 Old Swaffham Road, Gayton. 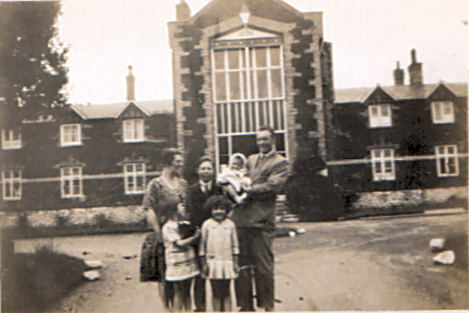 The picture below (the workhouse master and matron?) dates from around 1929. The buildings have now been redeveloped for residential use. Norfolk Record Office, The Archive Centre, Martineau Lane, Norwich NR1 2DQ. Holdings include: Guardians' minute books (1835-1930); Births (1837-1935); etc.